No need for oily drawn butter when you could have lobster cooked in a warm vanilla scented butter bath! I created this dish for a client, who wanted lobster with butter, but not the messy traditional drawn butter. I used a technique created by Chef Thomas Keller, but put a twist on the recipe by incorporating vanilla flavor into the butter sauce. Vanilla and lobster go great together! The butter sauce creates a stable environment for the lobster to cook without the milk solids separating from the fat. I skewered the lobster meat before cooking it so the lobster didn’t curl up. But you can serve this without skewering the lobster, if you don’t mind it curling. 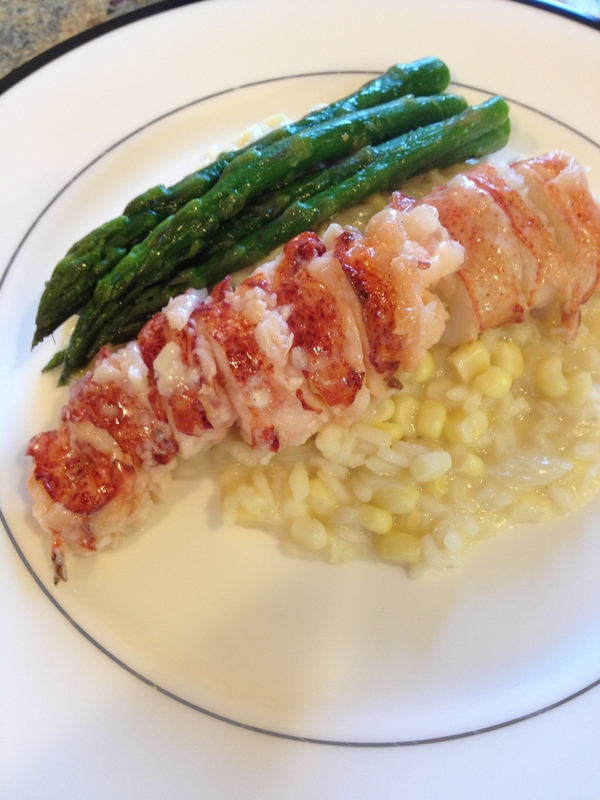 I served the lobster tail over fresh summer corn lemon risotto and simple sautéed asparagus spears. The client and their guests loved it and they were surprised that vanilla paired so well with the lobster. 1 stick butter, cut into 8 tbs. Bring the water to a boil and reduce to 1 tbs. *The skewers keep the lobster tails from curling during the cooking process. You may omit these steps if you don't mind the lobster curling. It doesn't affect the flavor.